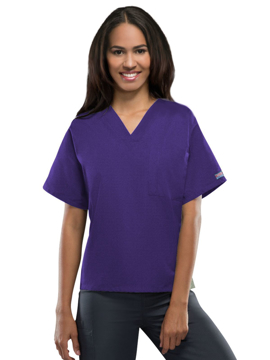 This classic v-neck top features a chest pocket with pencil stitch, two patch pockets, logo label with I.D. loop, and side vents. Center back length: 29". Easy comfort meets standout style in this V-neckline tunic with front and back princess seams for a sleek feminine look. Pre-washed. Two top-entry pockets. Instrument pocket. Three pen loops. Side vents. Princess seams. Center back length: 27⅜". V-neck faux wrap tunic with set-in sleeves, 2 large top-loading patch pockets, 2 contouring back darts, and includes a hidden accessory tape inside right pocket and side vents. Center back length: 26⅜". 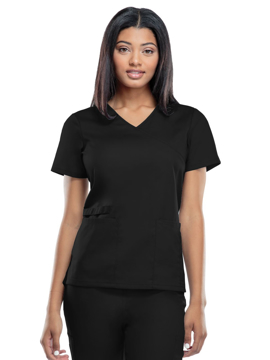 Snap front tunic with a notch neckline, matching cloth snap-ring closures, set-in sleeves, 2 large top-loading patch pockets, and includes front and back princess seams, hidden accessory tape inside right pocket, and side vents for movement. Center back length: 26⅞". 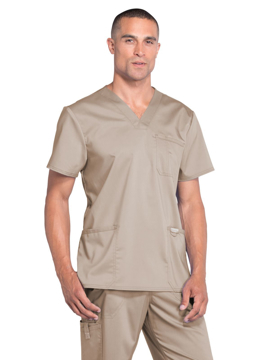 V-neck style tunic with short set-in sleeves, 2 large top-loading patch pockets, a hidden accessory tape inside right pocket, and includes a cell phone pocket and side vents for movement. Center back length: 27⅜". A crossover top with knit back panel and curved side vents. Two double pockets. Also features drop tail hem. Center back length: 28⅞". A v-neck sport tunic with knit panels at back yoke and underarms. Baby sleeve pocket and two top entry pockets. Extra badge and accessory loops. Also features a drop tail hem. Center back length: 27⅝". Simple and sporty top with tonal stitched set-in v-neckline with bust darts, tonal stitched arms, two angled welt pockets plus an additional welt pocket with interior mesh lining and back waist darts for shaping. Side slits at hem feature interior mesh detail and tonal stitching. Center back length: 25⅞". Bound surplice features front princess seam styling, back waist darts, tonal stitched arms, top-entry bound curved pockets plus an additional welt pocket with interior mesh lining and tonal stitching. Side slits at hem feature interior mesh detail and tonal stitching. Center back length: 26⅝". 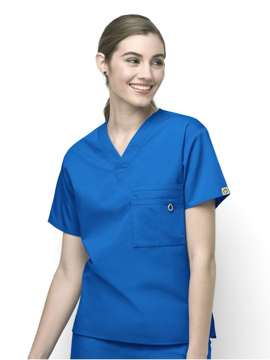 A classic tunic with front bust darts and back princess seams, double top-entry pockets with instrument division -the right pocket has three grosgrain pen loops with contrast triple stitching while the left pocket includes a badge clip. Center back length: 26⅛”. 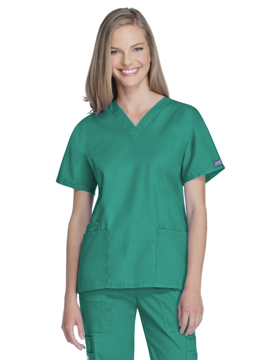 This surplice top offers a crossover neckline, two front top-entry pockets with instrument divider, plus dual color eyelets and two-toned cording. A badge clip on the pocket provides additional storage options, while a drop tail hem, with interior contrast grosgrain, provides you added coverage in style. Center back length: 28⅜". Sweetheart-shaped neckline and two double pockets with flat binding detail, front and back waist darts for shaping, logo rivet at side seam of pockets and accessory loop on left pocket. Center back length: 26⅜". Interwoven double V-neck with interwoven double V-banded sleeve cuff detail, princess seams, two sets of back darts for tailored waistline shaping, four inset double-angled pockets and tagless for even greater comfort. Center back length: 25⅞". Tailored crossover top with bound neckline, two roomy patch pockets, back darts for subtle shaping and side slits at the hem. Center back length: 27½". This comfortable maternity top features an inset crossover v-neckline with princess seams and forward shoulder yoke featuring self-loops on left for badge/pen holder. The self-tie adjustable empire waist was designed to accommodate your growing baby and the longer length covers your bump nicely. And you’ll really appreciate the angled top entry pockets with layered pocket on right for extra storage. Ideal for moms-to-be. Center back length: 31½". Crossover tunic with shaped waistline, six pockets, an accessory loop and tagless for even greater comfort. Center back length: 26⅛". 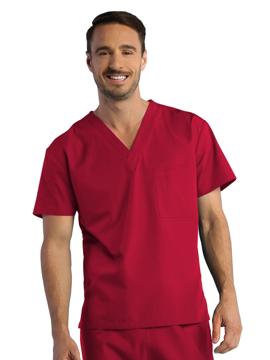 This unisex v-neck top features the WonderWink signature triple chest pocket, and ID bungee loop. Center back length: 28¾".